Yesterday we woke up to 8 inches of new snow! So obviously we were not going to be doing roadside Free Prayer! BUT, that did not stop the Free Prayer Ministry from happening. We started getting phone calls at 7:30 am until last night! The calls started coming in from all over the country. We prayed with people with depression, cancer, migraines, fear, stress, worry, anxiety, healing, broken hearts and the list goes on! The Lord said go down the street and shovel out a neighbor. As I was finishing up she came out and we wound up praying and ministering to her on the porch in the snow! The Lord is bringing people from everywhere to receive prayer even on the days were not out! ALL THIS TO SAY!!!!! This isn’t about us!!!!! The Lord knows where you are at any given time!! He will be there for you anywhere at any time you need Him! Jesus LOVES YOU and He is never going to leave you alone for a moment. Weather on your porch in the snow or on your back porch in Arizona, or in the rain in Iowa, He is there for you!!!!! Jesus loves you and so do we!!!!! We’ve had two days of snow but should be gone tomorrow! We were out Monday and had a few people from the church we attend stop for prayer! It’s getting pretty cold outside so we put up our banner and chairs and then go inside the glassed-in porch of the church at times to watch for cars pulling in. We are still praying for God to open any other doors He has for winter. We miss the Free Prayer Center in Storm Lake! We are setting up all this week in the parking lot of Gateway of Praise. Yesterday had 3 people stop. One was the 2nd referral from a family that stopped one of the first times we set up on this spot! She was crying when she stopped and said, “I’ve been looking for you!” She left with a huge grin on her face and all her stress and depression gone! She said she felt better than she had in a long time! TY, Lord! Emil is 95% recovered from the neck injury sustained last week so we will be back on the roadside tomorrow at the intersection of SH67 and Hwy 24 in the parking lot of Gateway of Praise church. At this point, it looks like this will be our winter set-up site. A woman stopped and said I don’t know what I want prayer for! I passed and the Lord said Loudly, go back and stop. She said she suffers from arthritis in her back and her left knee, but it was alright because is going to therapy. The Lord said this is NOT arthritis but unforgiveness! 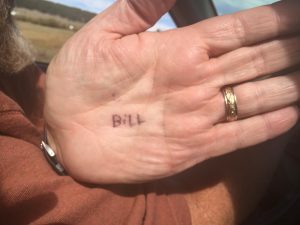 As she was talking the Lord said write the name Bill on your hand. If you just tell her this name she won’t recall it but if you write it and show it to her she will see it and I will recall it to her and IF she forgives him, THEN I will heal her because she has deep seated bitterness in her heart towards him. So I asked her about this name. She said NOPE! I have never had anyone in my life by that name! So I said well I wrote it down on my hand. As soon as I showed her my hand with the name written on it she immediately recalled that this was the name of her Uncle who had molested her as a child! As we led her in a prayer to forgive her abuser, the pain in her knee and back began to go away! By the next day she said she was feeling so much better as the pain was totally diminishing! So what’s in a Name! FORGIVENESS and HEALING! That’s our Lord!!! Today on the roadside up SH67 in Divide was busy! We prayed for a brain injury, Guidance for buying a house, a soldier who wanted to be a good leader of his kids, need for a building, and more! One guy stopped as we were packing up who was someone who stopped a few weeks ago! He said I was hoping you would be here!! You prayed for me because my car needs a lot of repairs. You prayed the Lord would take care of the repairs! WELL, since you’ve both prayed over my car it runs better than it ever has! God healed my car!! Now I discovered that the car has a slight bent part on the frame and it is wearing my tires out! Would you pray one more time for my car so I don’t need an alignment? After we prayed he said thank you Lord! Now I don’t need an alignment! He left after many hugs and rejoicing expecting that the Lord healed his car a second time! God is amazing!! This Wednesday September 12th is our 15th Anniversary of doing Roadside Free Prayer! We have seen thousands of people saved, thousands of people healed, and prayed for an untold number of people! The Lord never ceases to amaze us after all these years! The roadside has been exploding here in Colorado! Just last Friday we had car after car stop for prayer! Karen and I had to split up to be able to pray for everyone! In years past this was a once in a while occurrence, BUT here in Colorado this has become almost the normal day out! We have seen a steady increase in people stopping since May 2018! Thank you to all of you who have partnered with us all these years!! Had to take our vehicle to the dealer today, almost 50 miles away, and get some work done. No one was more shocked than Emil when he checked in with a service writer who said to him, “Hey, weren’t you at the Veteran’s Rally in Cripple Creek?” Emil said, “Yeah, but actually I wasn’t at the rally–my wife and I were set up on the side of the road halfway to Cripple Creek.” He said, “That’s where I saw you! You were with the sign on the pull off! I remember seeing your orange banner when I came to the top of the hill. There was a motorcycle parked by you and you guys were praying for him. I thought that was the coolest thing ever!” He loved the idea of Free Prayer on the roadside! God is so amazing to have us all run into each other!